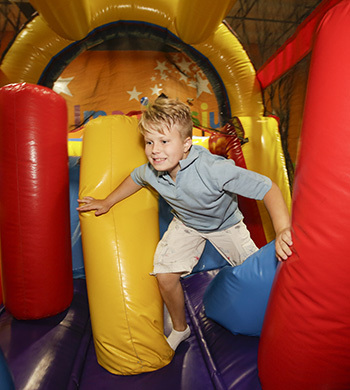 Our Open Jump sessions are open play time where your child can have the time of their life. It’s not only fun for the kids, but provides a healthy workout that burns off excess energy and helps keep them fit. It’s fun for kids of all ages. Our Open Jump Times are open to all ages at the cost of $8.00 per child aged 2-17 (+$1 on weekends), 1/2 price for 1 year olds, per session. Prices will be higher on holidays. Adults must stay and are free when accompanying a bouncing child! No food allowed or sold and party rooms are not open! Please check the calendar for times. Calendar is updated on Thursday for the weekends and the following week. Open Jump is for individuals and their families. Due to our limited space, we will not allow any school groups, daycares, or church groups to attend Open Jump. If you are a school, daycare, or church group please check out our field trip pricing or call the store at 972-345-5253 to schedule your private event. Reserve a spot through our calendar.